Manual Call Point MC-150 is designed with simplicity in mind and conforms to the standard shapes and sizes of regulation. 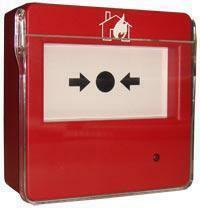 This call point is ideal for alert others of emergency for evacuation. LED indicator on the device indicates activation and will flash accordingly. A maintenance tool is provided to allow for east reset and testing. This MCP has improved features and comes with optional glass protective cover or taller mounting base. Conforms to EN54 Standard.